Thanks for explaining Firefox is working quite good. your combofix log got cut off, could you post the rest of it or attach it as a text file. Edited by Lazures, 16 March 2008 - 02:26 PM. Edited by andrewuk, 16 March 2008 - 02:37 PM. the SUPERantispyware scan only picked up cookies. the Panda Totalscan picked up cookies and a couple of false positives. the malware scan did though pick up some infections, and it looks like you did not check the items it found to remove them. so we will run the scan again. Double Click the malwarebytes icon on your desktop to run the program. Well it's ok actually.Thank you for ALL your help.I'm really glad to know that someone can help me with these. to wrap this up we need to clear away the fix tools, reset your restore points (there will be infections lurking in there) and i will leave you with some ideas on how to enhance the protection of your machine against future infection. 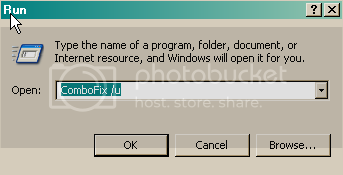 you can also clear away any other fix tools we used.